Qualified in Spiritual and Energy Healing, Yoga Therapy, Colour Therapy, Emotional Therapy and Postural Integration, Jean has been working in the field of personal growth, Healing and spirituality for over 35 years. Jean is involved at national level with the Complementary and National Healthcare Council, the regulator for complementary therapies and has been involved in setting the NOS for complementary therapies with Skills for Health. 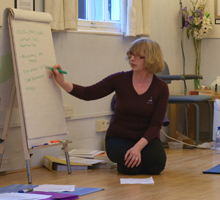 She has been with the College of Healing since 1990 and as a tutor for 15 years.